Keith Harrison, owner/operator and supreme tech guru at Total Home Technologies of Roseland, New Jersey. Keith Harrison's Total Home Technologies team uses MoCA technology to speed deployment and improve the profitability of the retrofit projects which comprise over half of the company's business. 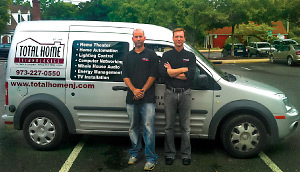 Keith founded this custom electronics business in 1992 and has grown it into a complete systems house, delivering home entertainment, advanced networking, and security systems with an emphasis on custom system integration and home automation. In keeping with his philosophy of making complex systems easy to use, Keith has expanded his business model to offer their clients ultra-convenient hosted security systems and locally-based online backup services. As Total Home Technology evolved, it's become increasingly focused on retrofit services, a real advantage in today's economy. But "retrofit" does not mean boring or unprofitable in Keith's world since he's managed to build a reliable client base, mostly of well- to-do (although not wealthy) families who typically spend $25k-$45k for systems that deliver premium- class entertainments, convenience, and security. In these mid-level installations, MoCA® technology has become an invaluable tool that Keith uses to take full advantage of the "pre-wiring" (Siamese cables, pre-pulled Cat-5, etc.) available in most of his clients' homes. While his crews usually have to pull some additional wiring to tie together the system's main components in a central location, they still make heavy use of MoCA adapters to deliver Ethernet connections wherever they are needed. Eliminating most of the uncertainties involved with new wire pulls allows Keith to be more confident when bidding a job and helps the seasoned Total Home team complete most of these jobs with a 2-person crew in four to five working days. This central media distribution center built by Total Home Technologies ties together several set top boxes, blue ray players, an audio/video server, and home automation equipment using a high- performance, VLAN-capable router. The ability of MoCA Certified products to help keep a project on-schedule and on-budget came in especially handy on a recent job where Keith ran into several challenges while adding a basic home entertainment + automation system (distributed audio/video + smart lighting, and HVAC controls) and security to a customer's home. It was a large (8-10,000 ft) 2-story building, with a finished basement, a big garage, and pre-wired with Siamese cable (dual coax + 1 CAT-5) in a home-run configuration that terminated in the basement mechanical room. 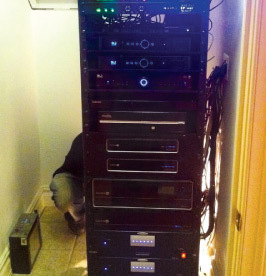 Keith's team took advantage of the existing cabling and installed a rack to house several set-top boxes, a DCVD changer, a media server and an 8X8 video distribution switch. As usual, they also replaced the GPON operator's consumer-grade Ethernet router with a business-class unit that would reliably support the VPN services and multiple HD video streams the new system would be running. Despite the home's abundant pre-wiring, the existing cables still did not provide enough connections to deliver the MSO's video programming, video from the central media sources, audio streams, and remote control signals to every room. Keith solved part of the problem by delivering locally- sourced HD digital video over one of the CAT-5 pairs using digital baluns. Since only the den and a couple of other rooms had existing speaker wires, the second coax was used to deliver central audio to the remainder of the house. This left several major issues to be solved. For one thing, he needed a connection for the Control4® home automation system's in-room control box, which normally requires a separate CAT-5 run. Instead, Keith used the Siamese cable's coax cable and a MoCA adapter to derive an Ethernet port in the rooms where it was needed. Using MoCA to light up the home's coax also solved the problem of providing Ethernet connections for any Internet-enabled TVs or in-room media players. 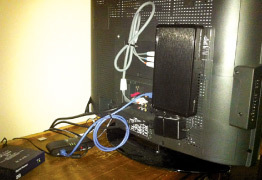 For example, adding MoCA adapter and a low-cost switch in the den provided Ethernet connections for the mini-theater's new HDTV and home automation box, as well as the owner's existing surround sound receiver and networked gaming system. Media from the home's central video system is delivered using an HDMI balun (box at left) over existing twisted pair cabling while a MoCA coax adapter (lower middle) provides a channel for the central control's infrared remote (box on back of TV) and an Internet connection. By taking full advantage of the existing Siamese cable plant with a combination of HDMI baluns and MoCA coax adapters, the two-man crew was able to wire a large home with high-definition IP video service, home automation, central audio and security without cutting a single new hole. By knocking at least three working days worth of wire pulls from the install team's workload, MoCA technology and products helped them complete a $55K project in one working week. It's no wonder that MoCA adapters are now part of the standard equipment load when Keith's trucks head out to a job site.